The response for my previous culinary arts session for Matcha Azuki bean macarons was overwhelming and I was told to prepare for another session perhaps later this year. I thought, why not try another simple and yummy flavour -- chocolate! 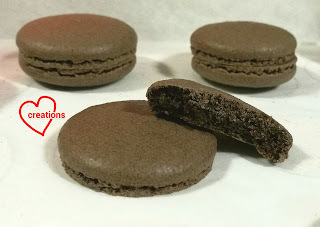 I have provided a detailed explanation in my Matcha Azuki bean macaron post so I will not repeat some of the details like why I chose to demo French method instead of Italian and explaining the basic ingredients. What's different here is of course the addition of cocoa powder to make the shells chocolate flavour. If you are new to making macarons, I strongly suggest that you read my Matcha Azuki bean post to have a better understanding of the basics. 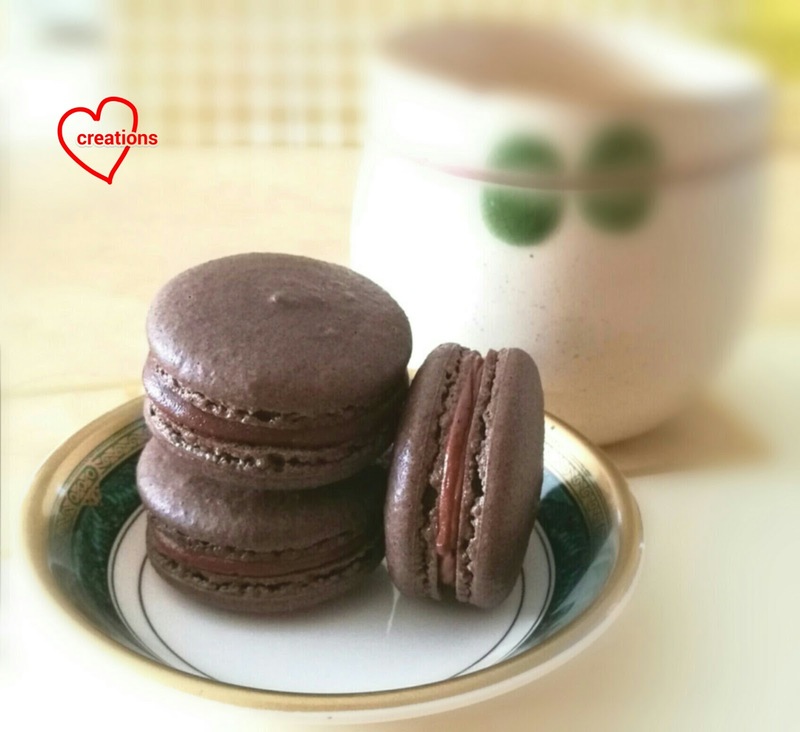 A quick Google search will show you that you may use either natural or Dutch processed (alkalized) cocoa powder for making macarons. I have chosen the latter as it has a more mellow flavour and because of something I observed​ in my bakes. 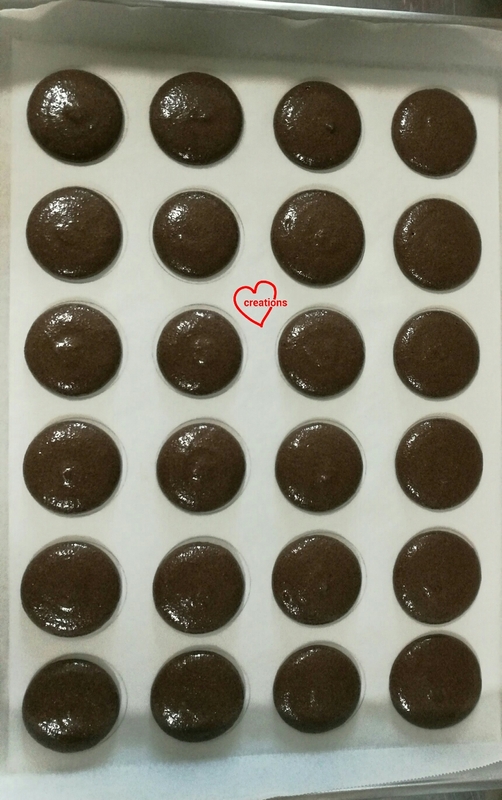 I have always used Dutch processed cocoa powder for baking chiffon cakes and macarons (both use meringues as leavening method) as I find that the natural ones tend to deflate the batter/ meringue. 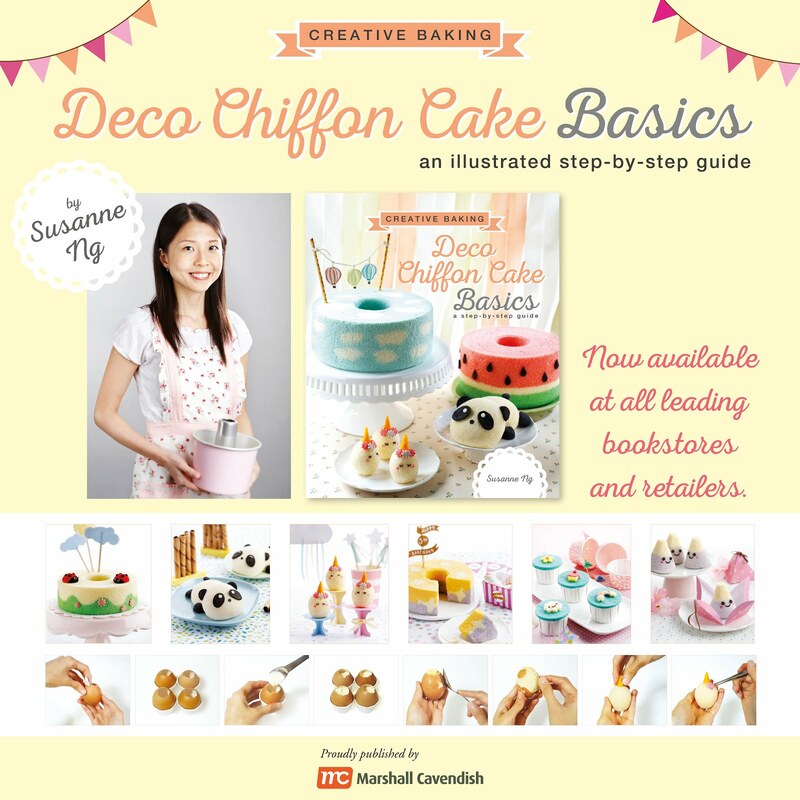 In the case of macarons, it will cause the batter to be runnier and the baked shell denser. 1. 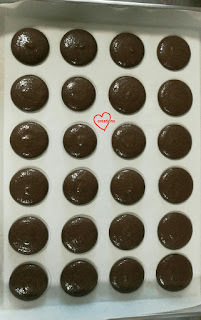 Prepare a baking tray with an array of 4cm-circle template. This template is optional if you are able to pipe shells of roughly the same size. Line the tray with baking paper. 2. Sift almond, icing sugar, cocoa powder and salt (if using) together into a bowl. 3. Place egg whites in a clean, grease-free metal bowl with cream of tartar (if using). Use an elextric mixer and beat on medium speed until frothy. Gradually add caster sugar while beating. Continue to beat until stiff peaks are formed. When stiff peaks just start to form, you will be able to turn the bowl upside down without the meringue slipping out. You may be tempted to stop beating at this point for fear of over-beating the egg whites. Don't be shy, continue to beat for about several seconds more until the meringue is really stiff. 4. Scatter about 2tbs of almond mixture over the meringue and fold in gently with a spatula in one direction. 5. Continue by repeating step 4 until all the almond mixture is incorporated. As more and more almond mix is added in, you may fold a little less gently to make sure everything is homogeneous. 6. Test the consistency of the batter at this point by scooping up a generous amount of batter and letting it fall back into the bowl. 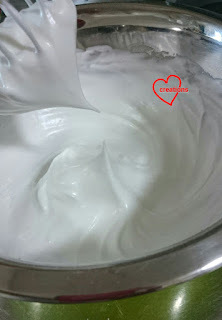 If the batter flows smoothly and slowly in a continuous ribbon, it is ready. But if it breaks off at a few points or doesn't flow well, continue to fold a couple of times and check again. This is perhaps the trickiest part of macaron making as newbies may find it hard to gauge when is the batter ready. 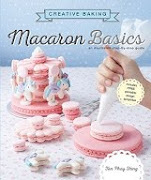 You may refer to my video tutorials for macaron basics over here to have an idea of the consistency. Do not overfold the batter. If it is very runny (like thick sauce or some cake batter), chances are you have overfolded and you have to start over. The French method is less forgiving than Italian method when it comes to overfolded batter. 7. 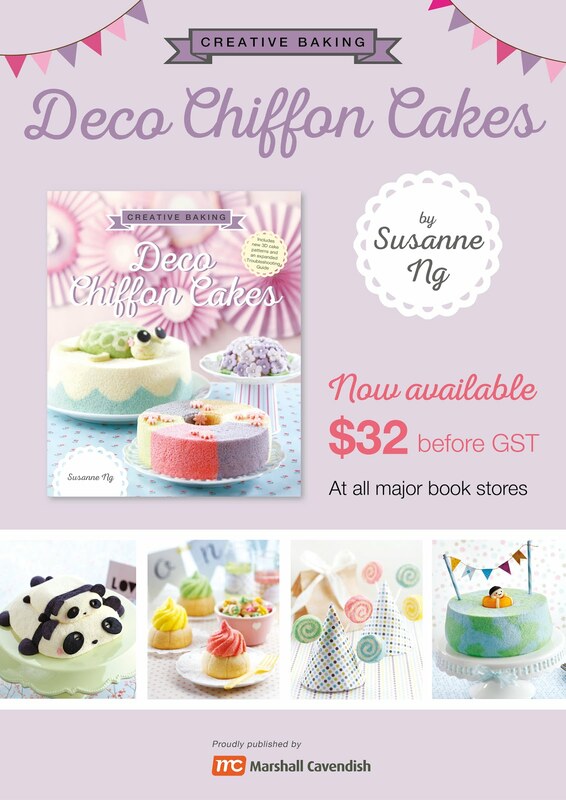 Transfer the batter into a piping bag fitted with a 6-7mm diameter round piping tip. If you don't bake often and don't have such baking supplies lying around, simply use a ziplock bag with a hole cut at one corner. 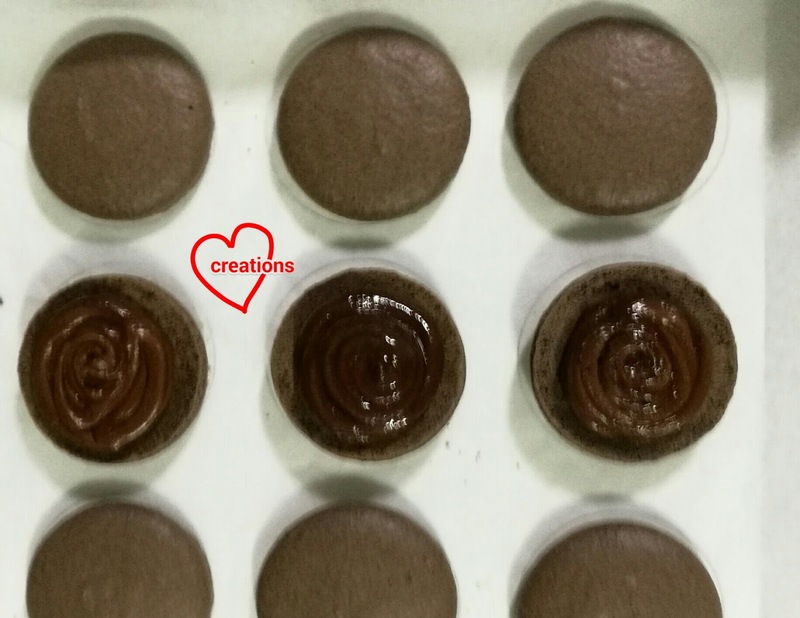 Your macarons won't turn out nice and round but will still taste the same. 8. Stick the 4 corners of the baking sheet to the tray with a little batter. Pipe circles on the prepared baking tray. To do so, place piping tip at the center of the circle, perpendicular to the tray and about 5mm away from the surface. Squeeze the bag and release pressure when the edge of the batter is about 3mm away from the edge of the circle. Give the tip a little twirl as you lift off. 9. Bang the tray on the table to release trapped air bubbles as well as flatten the peaks in the middle. 10. Preheat oven to 160°C. Set oven rack to lowest position. Note: use top and bottom heating elements only. Do not use the fan mode in the oven. Some people get good results with the oven fan on but I see more cases of uneven feet, warped shells, cracked shells and browning when the fan is on. Always use an oven thermometer! Actual oven temperature may be 10-20°C off from the temperature you set. 11. Dry the shells by leaving them under the fan or in an air-conditioned room until the surface is dry to touch. The shells must not feel sticky at all before going into the oven or they will crack. This may take 1-2h. I found that using the hairdryer works really well to speed up the drying. 12. Put tray of macaron shells in oven. Turn the temperature down to 140°C. Bake for 17-20 minutes or until the feet no longer appear wet. Let the shells cool completely on the tray before gently peeling the baking sheet away from the shells. 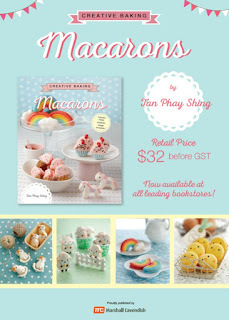 Do not peel the macaron away from the sheet as parts of the shells may remain stuck on the sheet. If the shells are really stuck, chances are they are underbaked. Dry them out in the oven for another 5 minutes and try again. Repeat if necessary. Perfectly baked shells should have no hollows, not stuck to baking sheet, have crisp outer shell and soft chewy interior. It's ok if the freshly baked shells are a little more on the crispy side. Simply store assembled macarons for a couple more days before consuming. Don't be discouraged if you don't get it right the first time. Practice makes perfect! The dark chocolate ganache recipe that I am sharing doesn't have to be followed to the letter as it depends on your personal preference. I am catering to Singapore's hot climate and prefer something that won't turn too runny when being stored at aircon temperature for 2-3 days. Some prefer to use ganache as it is but I prefer to whip it for a lighter texture so the whipping step is optional. A basic ganache recipe just includes two ingredients -- chocolate and heavy cream. I include things like a little salt and vanilla bean paste (and sometimes coffee and liqueur) to enhance the flavour. A typical ratio of 2:1 for dark chocolate : cream is usually used but I find this ratio too runny for Singapore's climate. I use 3:1 with some addition of unsalted butter for a firmer ganache. 1. Place chopped chocolate and butter in a microwave-safe bowl. Heat at medium power for 20 seconds. Use a spatula to mix well. Repeat until mixture is smooth and melted. 2. Place cream in small saucepan. Heat until it starts to bubble. Pour over melted chocolate mixture and stir in one direction with a spatula until smooth. 3. Add fine sea salt and vanilla paste. Mix well. 4. I like to whip up my ganache so it's lighter in texture but this is optional. You may let the mixture stand at room temperature until it firms up to toothpaste consistency. Alternatively, refrigerate for several minutes before beating mixture with spatula. Return to fridge for another 3-4 min and beat the mixture again. If it's not as light and fluffy as you prefer it to be, return to the fridge one last time for another 3-4 min and beat again. 5. Transfer to piping bag and fill the shells. Refrigerate the assembled macarons for at least 24h in airtight container before serving. Let the macarons sit out at room temperature for 15-20 minutes before eating. 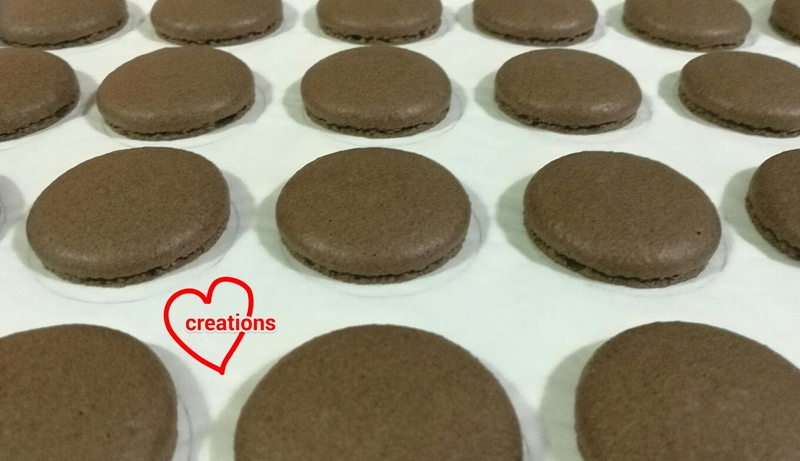 If you are patient enough, let the macarons mature in the fridge for 3-5 days before consuming. The taste and texture will be way more awesome than when freshly assembled. Here's hubby's critique of the macaron and mind you, he has a golden palate! "The richness of the chocolate was a party in my mouth. Bitter yet not too bitter, a touch of sweetness, no cloying stickiness that ganache sometimes has, and offset by a slightly chewy, crunchy shell." Thank you so much for sharing this recipe! After many trials I finally made them with success using your recipe. 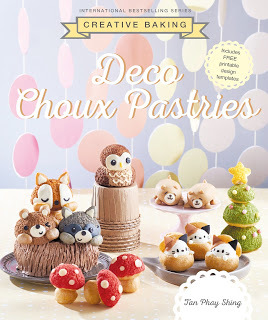 My question is if I don't want to use cocoa powder for this recipe but just use coloring do I had to alter the recipe? Thanks! Thanks​ for the quick response. 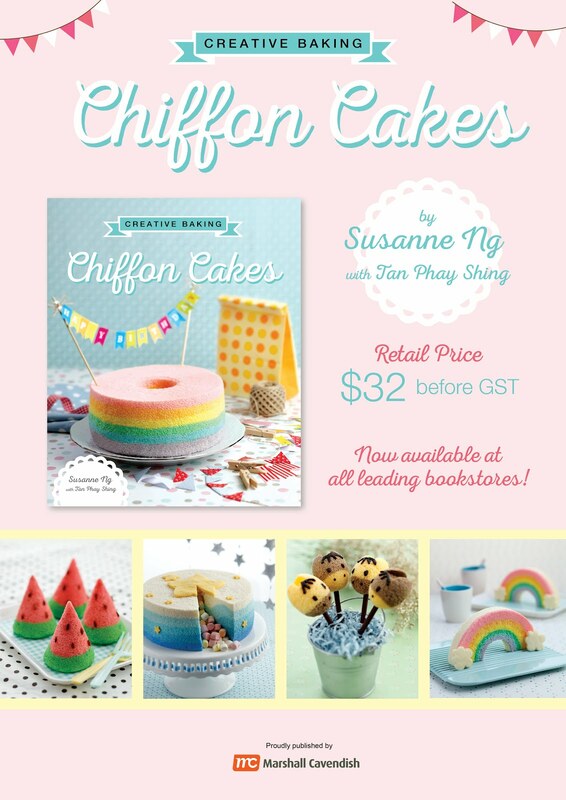 U would like you keep to this recipe.do I need to add corn flour like your other recipe too? That depends on the type of icing sugar you use. If the icing sugar already contains cornflour, there's no need to add more. 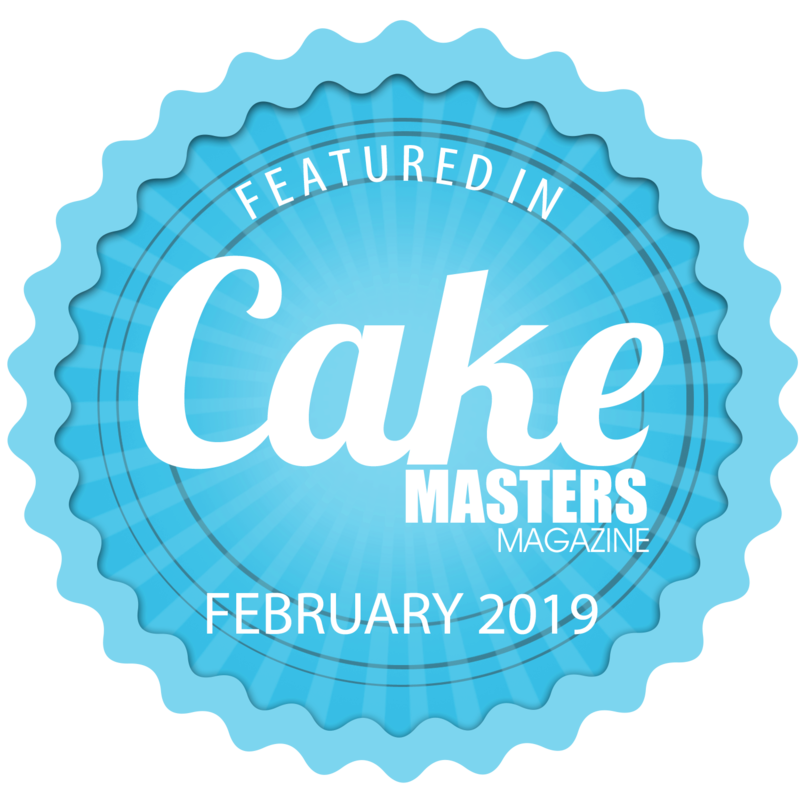 If you are using pure icing sugar, please follow my reduced sugar recipes for the amount of cornflour and rice flour replacement. Will do so. Thank you so much for your quick reply and for being so kind to share your work. Are there any methods to prevent condensation? The macarons from the cafes are usually dry to touch when we eat them. Thanks! Hi Denise, leave them out at room temperature and the condensation will eventually disappear. Yes this is something unavoidable in hot and humid SG. 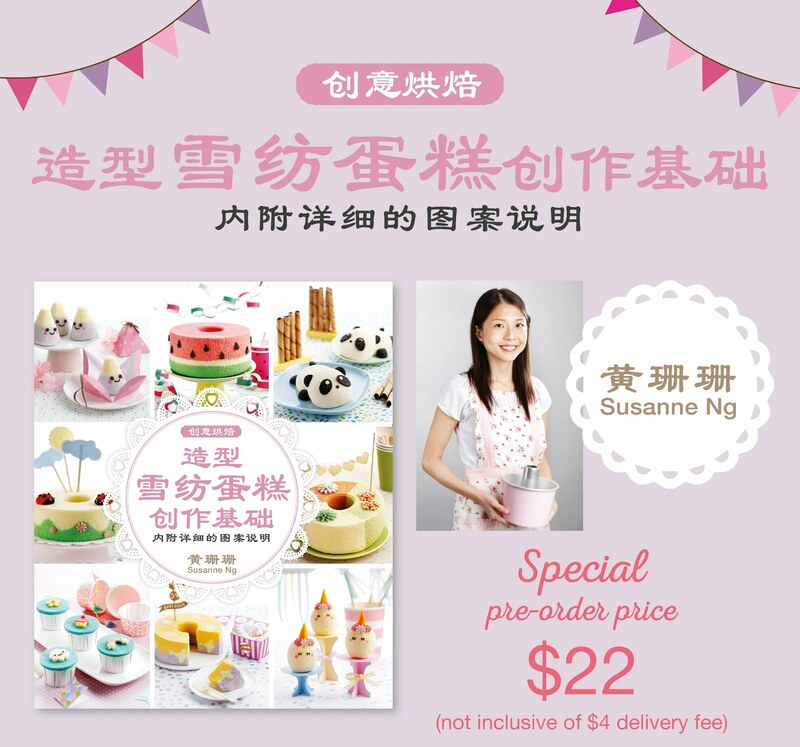 Hi Phay Shing, can I know where do you buy the heavy cream from? We can't get from anywhere. Can thickened cream be used? heavy cream is the same as whipping cream so just go for whipping cream :). Heavy cream or whipping cream has a high fat content. Thickened cream has stabilizers such as gelatine added so please don't use that. Oh I see. Thank you so much!